Finding out the secrets of using white balance is fairly simple once you gain an understanding of color temperature. Setting your camera's white balance is easy to do and will change the way you take pictures forever. White balance levels and values are set up on the camera to make the world look like the color it actually is to the human eye. 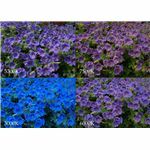 A digital camera does not perceive color the same way that humans do. The human eye will adjust colors automatically but the camera needs help and this is what white balance is for. If you are looking at a white flower the digital camera may not perceive the flower as white due to the color temperature of your light source. Color temperature determines the level or value you need to set your camera on your white balance function to correct the colors in your picture. If your are using your “auto" function most of the time the camera will correct the white balance automatically to the correct temperature, but sometimes it makes the wrong adjustments. Adjusting your white balance manually is preferable to ensure that you do not get a blue, orange or green color cast over your images. 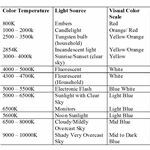 Color temperatures vary depending on your light source. 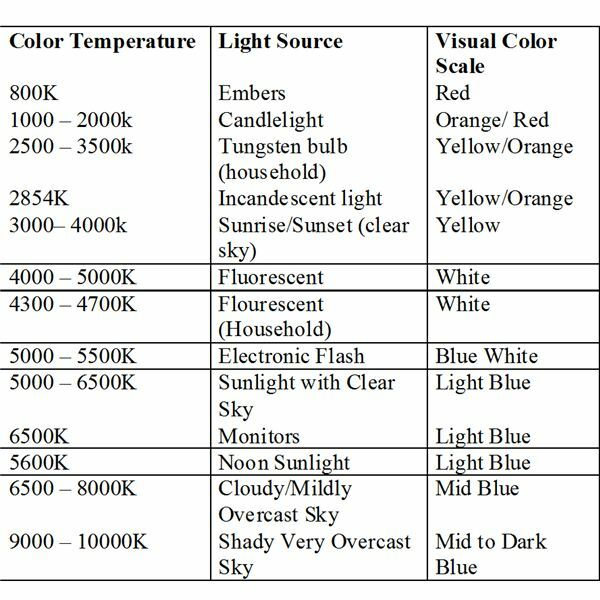 A rough guide to color temperature is shown in the table on the left. The color temperature is measured in degrees Kelvin. The color temperature in the table indicates the value you should adjust your white balance settings to. If you are in sunlight, for example, and it is a clear day your white balance should be set between 5000 to 6500K on your camera. Look at the example images; these were taken on a slightly overcast day. 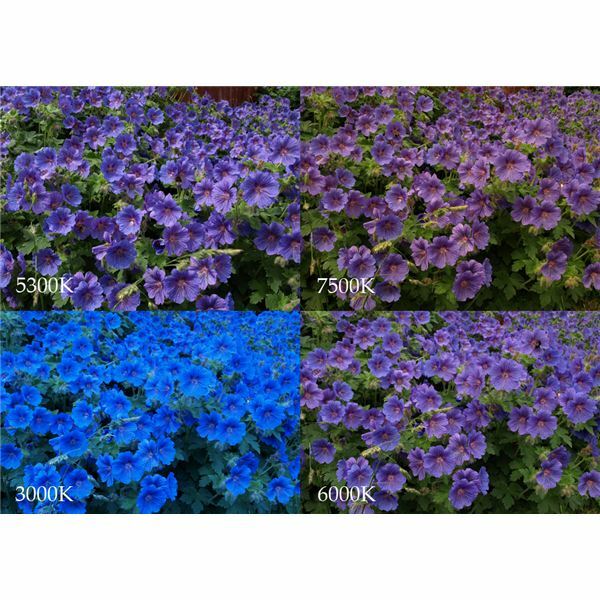 The correct image is the one set at 6000K; this white balance level and value has enabled the camera to make the flowers the right color temperature rendering a vibrant image without any color cast or dullness. The image here shows an picture taken on a slightly overcast day. Look carefully at the difference in color temperature and you will see that the correct setting for this image was 6000K. This setting has rendered the flowers in vibrant color without being dull or a color cast interfering with the picture. What if my camera does not have Kelvin values? A rectangular block with a hole either side and straight lines around the horizontal edges – this is for fluorescent lighting and will be preset to something between 4000 and 5000K. A sun – this is for sunlight and will be around 5000 to 6500K. A flash symbol – will give you a flash of light with a color temperature of between 5000 to 5500K. A Cloud symbol – this will give you between 6500 to 8000K. A house symbol usually represents shade as it will be a house with what looks like a triangular extension (this is the shade). The color temperature for this will be around 7500 to 8500K. On a DSLR digital camera you will be able to customize and be very exact about your white balance and setting your color temperature values. On a compact digital camera you will probably have the choices just listed; you should use these as they will improve your picture quality. As soon as you become aware of white balance and color temperature you immediately become much more aware of the lighting situation that you are in. Photography has always been about how we use light and where the light is coming from. The question you should be asking when you start taking an image is what kind of light are you working with. If you are inside check whether the light is a tungsten light or a flourescent light. Both these lights need different settings so it is important to check. If you are outside you may be tempted to forget about white balance but as shown in the pictures above even outside there are many different lighting situations and choosing the right white balance level and value will create a better and more vibrant image than if you just put on "auto" and hoped for the best. Remember that you can still use your "auto" function and change your white balance settings on most digital cameras. Once you start thinking about the color temperatures and their Kelvin values is actually quite easy to learn and put into action. Pick a subject inside or outside and try all your different white balance settings; this will give you a really clear indicator of how the function works and how it has affected your picture. Look at the images and think about how you see the images when not looking through the camera lens. If the image looks dull or a strange color then your white balance setting needs changing and is easily fixed. White balance on a digital camera can usually be found in the menu or your may have a "WB" button on the camera to make changing values even quicker. Make a habit of checking the white balance levels before you start snapping away and you will be guaranteed improved pictures. If you are worried about getting your white balance right when shooting your images there is a simple way to ensure that this can be adjusted post-production. Shoot in RAW on your digital camera and you will be able to change the white balance in Photoshop or using other post-production software. RAW is simply a file that has not yet been formatted and compressed automatically by your camera. What this means is that if you wish to adjust white balance settings after you have taken the image you can do this without degrading the image. To use the RAW settings on your camera you will need to install the RAW file converter that came with your camera to access them on your computer. If you are unfamiliar with using RAW on your camera; this is a good way to practice and to begin to understand white balance levels more fully.